A concrete driveway with a discrete trench drain inserted just before the gates. 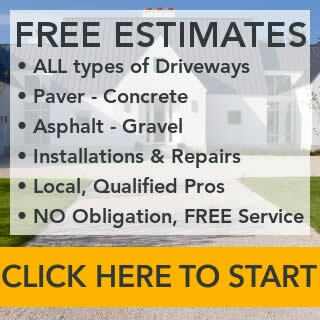 Whether you’re about to build a new driveway yourself or are contracting a professional to do the job, it pays to consider the drainage system for your driveway in order to avoid future problems. Having good a driveway drainage system is especially important if your home sits below the street level and your driveway therefore slopes down from the street towards your home or garage. Clearly, if this is the case, without correct drainage, you run the risk of water pooling at the bottom of the driveway and potentially entering your home and causing damage. Fixing driveway drainage problems after installing a new driveway can be costly, so it’s best to consider how to drain water away from the driveway whilst in the planning phase of your project. So let’s have a look at the different drainage systems for driveways, so that you can understand how they work and which one will best suit your home. What are the different ways to drain water from your driveway? 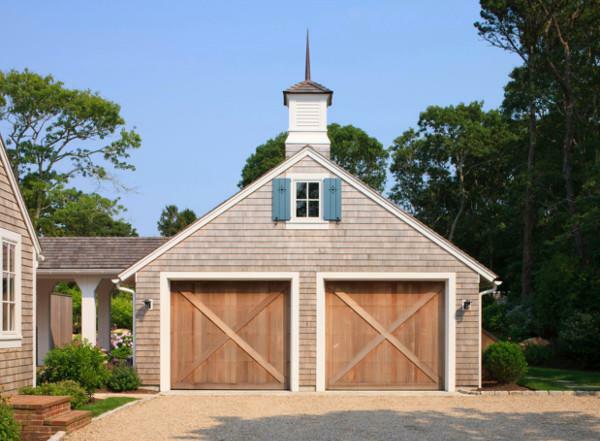 In an ideal world your house or garage will be sited on land that is slightly raised from the street level. In this way you can ensure that your driveway will slope downward from your property to the street level, creating a natural path for rain water to slow away from your home. 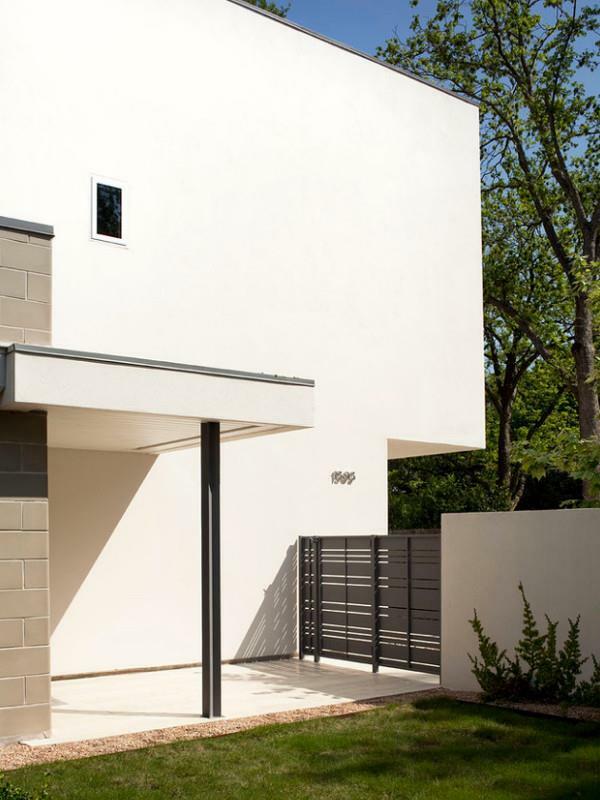 Whilst it’s true that having a home that is located higher than the street level will cause rainwater to natural run down towards the street, you might want to add a rainwater run off either side of the driveway, with metal driveway drainage grates sited every so often to ensure the water runs off correctly and into the main drainage system of your property. This run off is like a shallow channel that goes the length of the driveway and can be made using cobble pavers, bricks or cement. 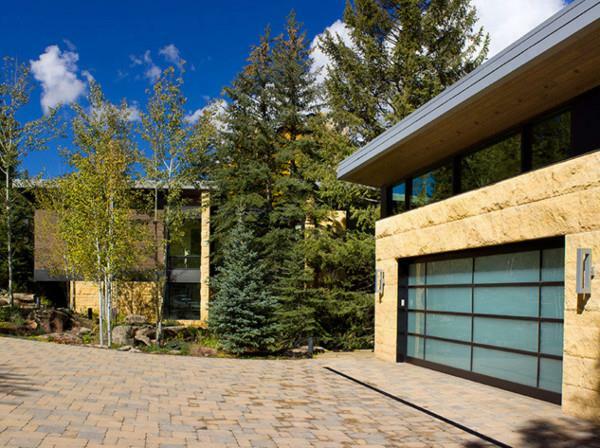 This long asphalt and cobblestone driveway has drainage channels built into the design. 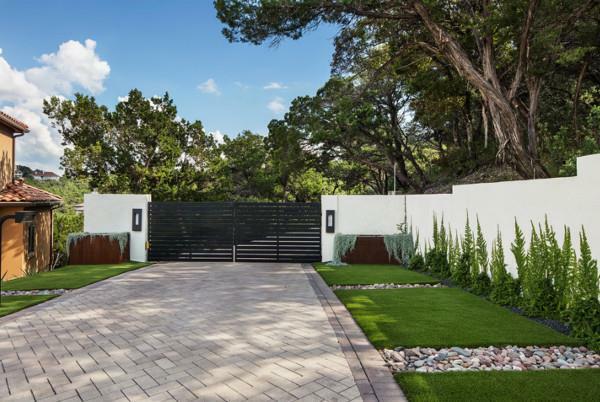 If your property is only slightly raised from the street level and has lawn or landscaping either side of it, then it may be worth consider creating driveway swales. A swale is created when the land either side of the driveway is slightly graded, making a shallow dip. This dip of the swale gives water a place to go, where it can then be absorbed into the ground below. Drainage swales are usually covered with lawn, but can also be disguised with appropriate landscaping such rockery work and water loving plants. Grass swales have been built into the landscape either side of this rustic gravel driveway. This is one of two driveway drainage solutions where your home is sited lower than the street level, that is to say where the driveway slopes down from the street towards your home. A small trench is dug along the entire width of the driveway – usually where the driveway meets the garage. Inserted into this trench is a metal U-shaped channel which is then connected to pipes that run water out to underground or street level drains, or potentially to a landscaped pond. The driveway channel drain works by collecting water flowing down the driveway and channeling it elsewhere. The channel drain is usually completed with a metal driveway drainage grate, which keeps debris such as leaves and plants form blocking the drain, and also allows your car to easily drive over it. There are different styles of metal drainage grates now available to personalize the look – some can be quite ornate, others are very slick and functional. In very wet climates or for very long driveways you might need more than one channel drain at different points long the driveway. An example of a channel drain at the end of a downward sloping paver driveway. 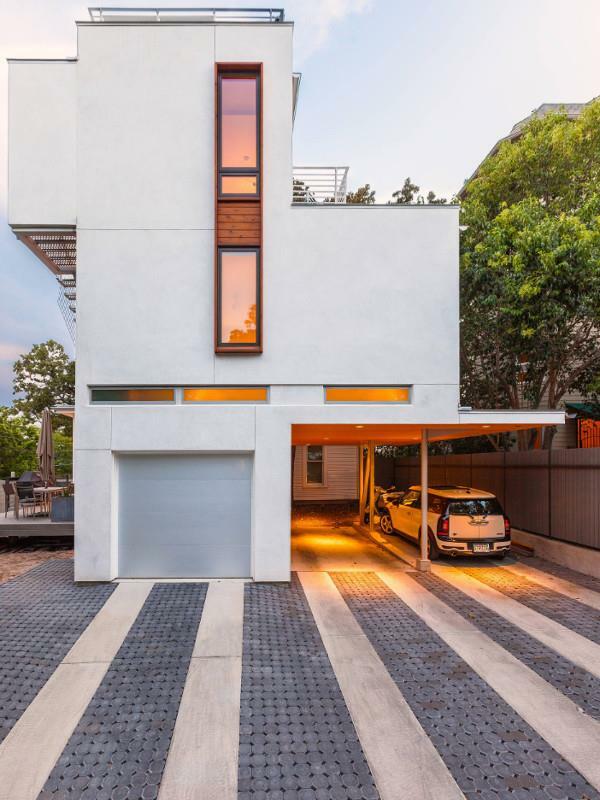 This is the second possible option for a driveway that slopes downwards. Often confused with a channel drain, a French drain essentially works the same way but has a different construction. With a French drain a large trench is typically dug along the length of a driveway, a perforated pipe is then placed in the trench and then covered with gravel or pebbles. The French drain perforated pipe needs to be sited low enough into the ground to intercept groundwater, and be laid at a slight angle heading downwards away from your home. The French drain works by allowing water above to trickle through the gravel layer, into the perforated pipe, and then channeled towards the street. To complete a French drain, it can be covered with topsoil and lawn, or you can leave the gravel or pebbles visible and make that part of the look of your landscaping. French drains covered in pebbles have been installed either side of this concrete driveway. open-cell pavers (concrete pavers with holes where you can plant grass or clover). pervious pavers where the joints are filled with gravel allowing water to pass around the paver. 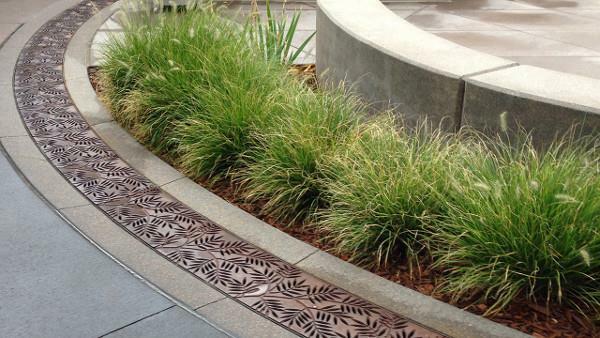 porous pavers that are made from a type of ceramic that actually absorbs water, drawing it down towards the ground. 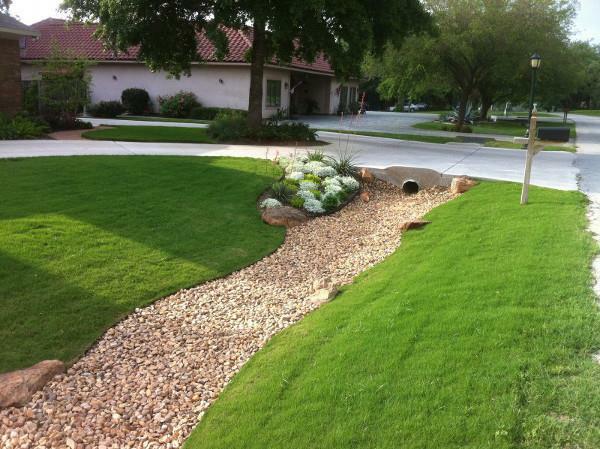 gravel, stone driveways or grass driveways where water can pass freely. 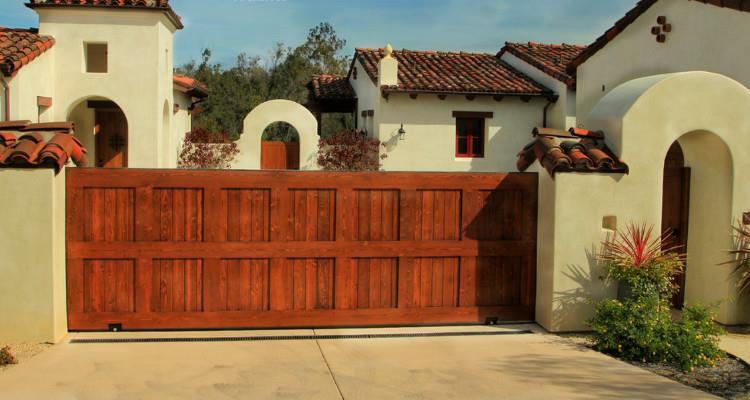 You can read more information on driveway pavers and paver driveway costs. 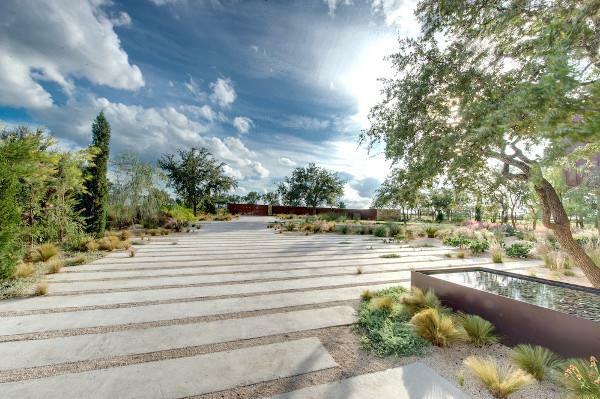 Open-cell pavers allow natural drainage and grass to grow in the gaps, creating a dramatic effect. What is the best concrete driveway drain? A channel or trench drain is the best option for a concrete driveway, particularly along its width where it meets your home. In an ideal world the channel or trench would be factored into the initial pouring stage of the concrete, but – with the right tools and effort – you can cut a trench into your concrete driveway after it has set. You may also consider adding French drains or swales either side of a concrete driveway to combat water running off the side edges. What about asphalt driveway drainage? Again, channel drains are the best solution for draining driveways that are made with impervious materials like asphalt. French drains of swales can also be installed along the sides. What is the best option for gravel driveway drainage? You may not need any extra drainage if you have a gravel driveway, as water should naturally work its way through the gravel to the ground below. 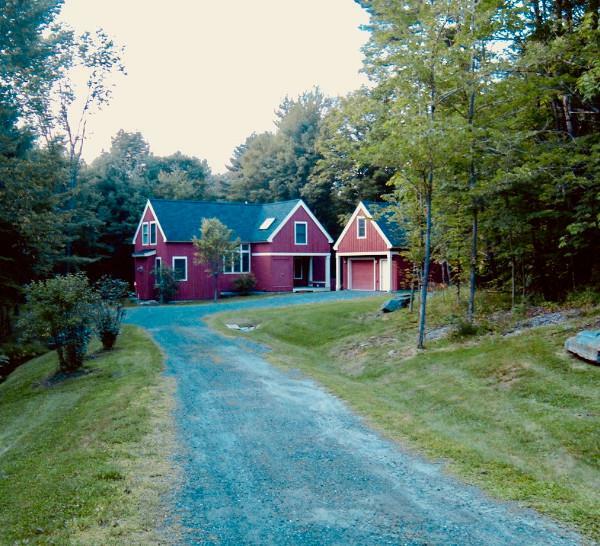 But if you have a very steep gravel driveway then French drains are an ideal gravel driveway drainage solution, as once covered in gravel you will hardly know the drain is even there. What else should I consider when planning driveway drainage? The most important thing when it comes to drainage around your home is to feel confident that you know what you are doing – we have see first hand DIY drainage projects that have gone horribly wrong, resulting in flooding that has damaged property and required costly repairs. 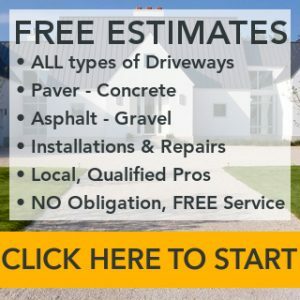 This article should be considered just a starter in your research as you explore the right drainage solution for your driveway; there are technical aspects to all of the above drainage solutions that need to be considered in the light of your home’s exact location and the budget you have to spend. 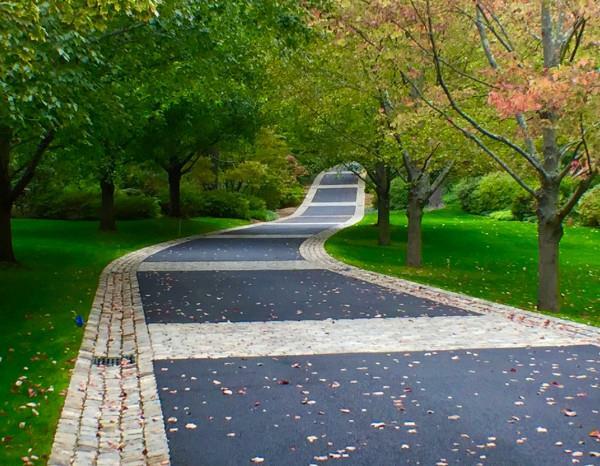 Qualified and experienced driveway contractors will be able to give you detailed advice about which driveway drainage solution is the best for your particular project. While the basic principles are as outlined above, there’s no reason why you can’t also have fun when designing your driveway drainage solution, especially if you have a great budget and can choose something a little bit out of the ordinary. Simply cutting curved gaps into concrete where grass can grow, is a clever, attractive and cost-effective drainage solution. 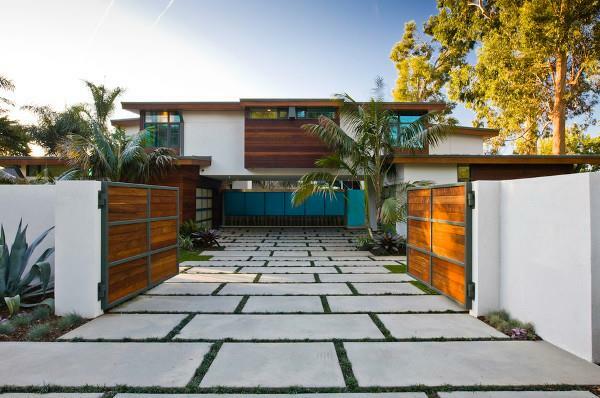 Using large scale pavers with gaps for drainage, creates a bold geometric pattern that is both pretty and practical. 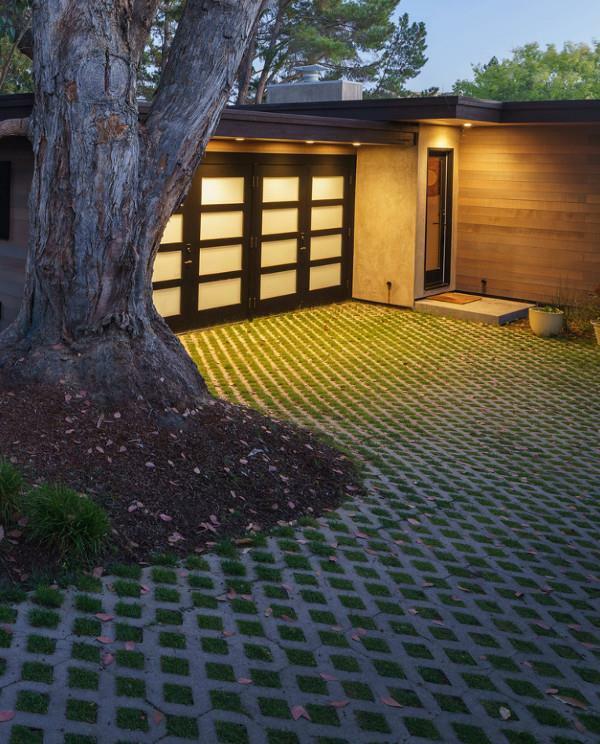 A similar effect here with large rectangular concrete pavers with gaps filled with fine gravel. 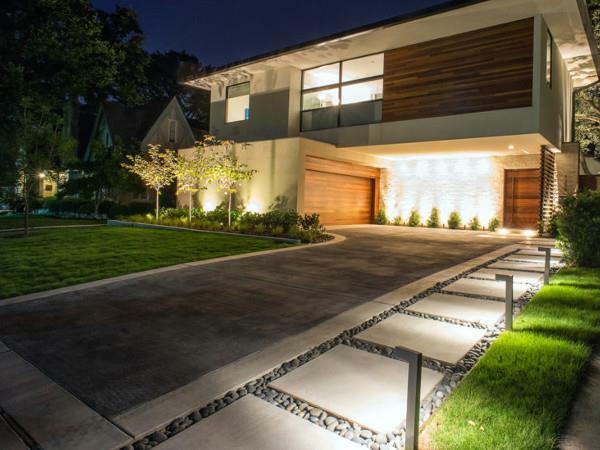 Pervious cobblestones style pavers allow water to drain through and give this driveway a contemporary design edge. Today trench drain grates come in lots of different styles, materials and colors, like this one with a very attractive leaf pattern made from iron. 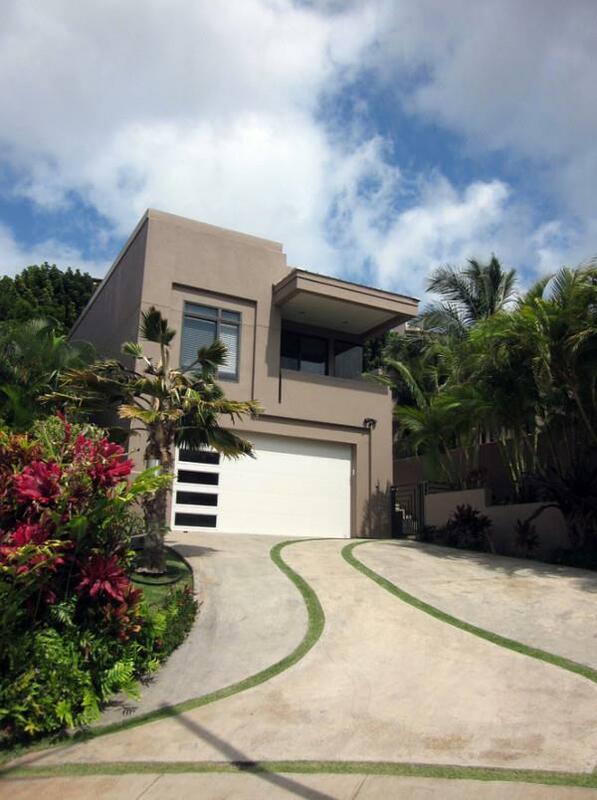 Swales finished with pretty rocks and pebbles have been landscaped into either side of this concrete driveway. This impressive gravel driveway is built up from the lower paddocks either side, creating a natural slop for drainage. 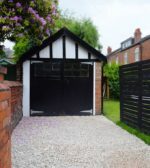 Gravel driveways are great for natural drainage, plus if there is a French drain in place you’d never know! French drains covered with large pebbles make up part of the landscaping either side of this brick driveway.